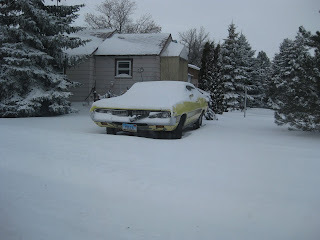 It appears that some people aren't too 'Yella' to drive their classic in the snow. In Michigan or any other of the salt-spewing rust belt states, you would have to be crazy to drive anything you didn't absolutely despise. But classic car obsessed North Dakota doesn't salt most roads - it dumps sand occasionally, and really just on the slick spots so it's an entirely different story. Although quite battered, this side exit exhausted and poverty-cap wearing muscle car is generally rust free, as indicated by the bare metal front valence and uncrunchy doors and quarters. May Michigan substitute sand for salt in 2010 and may the muscle car lovers substitute 100 foot rooster tails for smoke spewing out of the right rear tire, both forever changing the winter automotive landscape.